The summer of 2013 proved to be a crossroads in my life. As I was unsure of which road to take I decided to spoon some knobbies onto the old Bonneville and blaze my own path in hopes that I would make it out the other side. I packed nothing but a change of clothes, a camera, and a few tools in case of an emergency. I called in the last two weeks of my accumulated vacation time for the year and headed north out of Nashville. My plan was to explore the urban jungles of the Northeast in the hopes of finding a trail of breadcrumbs that would lead me to the correct route for my future. After a few days in Richmond, Washington, and Baltimore I ventured into Philadelphia area and struck up a conversation with an attractive brunette riding a Triumph Scrambler. I think I opened with something really smooth like, “I ride a motorcycle too”. Once the alcohol smoothed things over she introduced herself as Kimi and invited me to join her and some of her friends the following day for a ride. I agreed to meet them at a little diner called, “Mom’s Restaurant” about an hour outside of Philly just north of Trenton, New Jersey. The group was composed of perhaps ten riders and a healthy mix of European flavored naked sportbikes. After a quick breakfast and some loose introductions we were off. I spent the rest of the day trying to keep up as Kimi lead the pack sliding off the seat of her Triumph Scrambler in the corners as if the streets of North Jersey were her own personal racetrack. At lunch she talked about taking month long trips to Florida and back, doing track days on a BMW F650, and riding dirt bikes in West Virginia. She smiled and commented that she would take two wheels through the woods over a beach any day. Kimi is not the only one. More and more we see women abandoning social norms and embracing the culture of two wheels. With this shift in demographics we have seen an increase in the demand for female specific riding gear while supply has been slow to keep up. As a major player in the adventure touring market, Klim will be introducing the all-new 4-season Altitude Jacket and Pant combination for 2014 with a fit specifically tailored to the female form. The main feature of this all-new Altitude offering from Klim is the fit. Klim worked with the input offered up by hundreds of female riders to design a jacket and pant combination that would work perfectly with their body type. With adjustable gussets at the waist it is possible to expand hip circumference up to 6 inches. This coupled with waist and arm adjusters ensures a perfectly tailored fit. New sizing was created to address the needs of all ladies who decide to throw their leg over a two-wheeled machine. 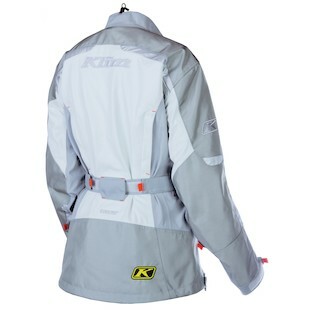 The shell of the Klim Altitude Jacket is comprised of a Gore-Tex Misano Performance Fabric with reinforced 840D high-density nylon abrasion zones at the elbows, shoulders, and lower rear hem. By localizing the stiffer 840D panels Klim improves the overall feel and comfort of the jacket without sacrificing abrasion resistance in the event of a tumble. Impact protection comes by way of CE 1 rated D3O armor. D3O EVO armor can be found at the shoulders and elbows with a D3O Flo 1 back protector insert included standard. D3O armor is known for it’s ability to take multiple blows without losing it’s effectiveness to keep you safe. Utilizing 3M Scotchlight reflective technologies, the Altitude features increased visibility along the back, chest, and arms. Cooling from the summer heat is provided by six nicely sizes vents. There are four intake vents at the biceps and armpits and two large vertical exhaust vents on the back. Six water resistant pockets provide plenty of storage as well as an ID pocket. When you register the jacket Klim will even send you a personalized emergency ID card to keep with you in the event of a crash. The Altitude jacket is design in correlation with the matching pants. The pants feature the same Gore-Tex Performance Shell with the addition of Gore-Tex stretch panels in the groin for increased comfort and range of motion. 840D Nylon is found at the knees, inside the lower legs, and at the seat to insure added protection in the impact zones. Leather is found inside the knee panels for increased grip against the tank. 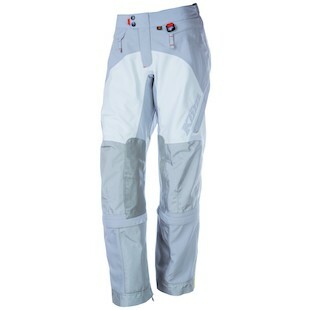 Fit was once again Klim’s main focus when designing these pants. Tailored specifically with women in mind, the Klim Altitude Pants are available in 11 different sizes. There are additional adjustment straps at the waist as well as inseam expansion gussets that add four inches to the length of the pants. The cuffs have snaps to allow the rider to tighten the pants around their boots. D3O EVO armor is strategically placed at the knees and the hips to provide comfortable, yet effective, impact protection. There are four vents, two in the front and two in the rear to ensure effective airflow in the warmer months. The pants utilize the same 3M reflective technology found in the Altitude jacket for maximum visibility. The pants and jacket feature YKK zippers throughout and attach to one another with a zipper connection. The color scheme is a grey and silver base with a very pale hint of lavender throughout and is finished with orange accents. 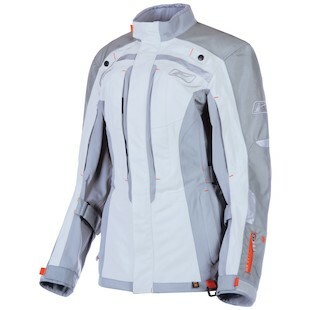 Overall it is a very classy and stylish offering from Klim that will be a fantastic option for women of multiple riding styles. By the time our ride came to an end that afternoon we had put over 300 backroad miles on our odometers before turning around to head home. Not only was Kimi one of the most proficient riders I have ever had the pleasure of trying to keep up with, but as it turns out, she had been riding the whole day with a broken left wrist. “Dirt bike accident”, she said with a smile as she proudly displayed her purple cast. It is so refreshing to see more and more ladies entering the sport. Not only does it mean more women are getting to experience firsthand the thrill traveling on two wheels but it means that girls like Kimi are keeping all us boys on our toes. If the Altitude is any indication of future offerings from Klim I would say ladies everywhere have something to look forward to. As for my crossroads dilemma? One of the guys from the ride that day was an architect who works for Liberty Property Trust. He told me they had just designed a building for a very hip young company called RevZilla and suggested I look into them. The rest as they say, is history.